This review covers the literature published over the last 5 years on the practical use, synthesis, and oxidation of 1,4-dihydropyridines (1,4-DHP). A summary is given on recent research on the biological activity of 1,4-DHP (Hantzsch esters) as antioxidants and calcium channel antagonists. The article provides information about the main trends in the development of pharmaceuticals based on 1,4-DHP. The main directions of the synthesis of 1,4-DHP systems, closely linked to the development of new biologically active substances, are discussed. New and traditional methods for the aromatization of 1,4-DHP are summarized, including recent studies on the mechanism of this reaction. Eisner, U., Kuthan, J. The Chemistry of Dihydropyridines. Chem. Reviews, 1972, vol. 72, р. 1-42. Kuthan, J., Kurfürst, A. Development in Dihydropyridine Chemistry. Ind. Eng. Chem. Prod. Res. Dev., 1982, vol. 21, р. 191-261. Gromov, S.P., Fomina, M. V. Advances in the synthesis of 4-aryl and 4-hetarylpyridines. Uspehi himii, 2008, vol. 77, no. 12, р. 1129-1152. Sausinsh, A. E., Dubur, G. Ya. Synthesis of 1,4-dihydropyridines in the cyclocondensation reactions. Himiya geterotsiklicheskih soedineniy, 1992, no. 4, р. 435 467. Morkovnik, A. S., Ohlobyistin, O. Yu. Heterocyclic cation-radicals. Himiya geterotsiklicheskih soedineniy, 1980, no. 8, р. 1011-1029. Matern, A. I., Charushin, V. N., Chupahin, O. N. Progress in the study of oxidation of dihydropyridines and their analogues. Uspehi himii, 2007, vol. 76, no. 1, р. 27-45. Odyinets, A. G., Simkovich, B. Z., Kimenis, A. A., Dubur, G. Ya. Pharmacological effects and mechanism action of 1,4-dihydropyridine drugs on cardiovascular system. Him. farm. zhurn., 1986, no. 12, р. 1443-1455. Edraki, N., Mehdipour, A. R., Khoshneviszadeh, M., Miri, R. Dihydropyridines: evaluation of their current and future pharmacological applications. Drug Discovery Today, 2009, vol. 14, no. 21-22, р. 1058-1066. Vitolinya, R. O., Veyta, V. K., Kimenis, A. A. Study of the influence fenigidin on the cardiovascular system. Eksperimentalnaya klinicheskaya farmakoterapiya, 1985, no. 14, р. 124-128. Kastron, V. V., Vitolin, R. O., Dubur, G. Ya. Synthesis and Pharmacological Activity of 1,4-dihydropyridines. Him. farm. zhurn., 1990, р. 14-20. Skrastinsh, I. P., Kastron, V. V., Vitolin, R. O., Stivrinya, M. I., Zolotoyabko, R. M., Dubur, G. Ya. Synthesis and Pharmacological Activity of difuro-1,4-dihydropyridines. Him. farm. zhurn., 1989, no. 2, р. 176-178. Zadionchenko, V. S., Shehyan, G. G., Byileva, A. A., Schikota, A. M., Yalyimov, A. A. Normodipin role in the treatment of patients with cardiovascular disease. Rus. med. zhurnal, 2009, vol. 17, no. 23, р. 1554-1558. Katelnitskaya, L. I., Haisheva, L. A. From short-nifedipine to amlodipine and fixed combinations. Problem in the light of contemporary recombination treatment of hypertension. Ratsionalnaya farmakoterapiya v kardiologii, 2008, vol. 4, no. 2, р. 76-80. Makarounas-Kirshmann, K., Glover-Koudounas, S., Ferrari, P. A meta-analysis comparing the tolerability of lercanidipine and other dihydropyridine calcium channel blockers. Kardiovaskulyarnaya terapiya i profilaktika, 2010, vol. 9, no. 6, р. 63-73. Samerhanova, L. N., Lukyanov, M. M., Masenko, V. P., Boytsov, S. A. Features water-electrolyte metabolism in hypertensive patients and its impact on the parameters of the different classes of antihypertensive drugs. Sistemnyie gipertenzii, 2012, no. 2, р. 53-60. Shilova, E. V., Martsevich, S. Yu. Dihydropyridine calcium antagonists: role in the modern treatment of cardiovascular diseases. Ratsionalnaya farmakoterapiya v kardiologii, 2008, vol. 4, no. 2, р. 53-57. Borghi, C., Prandin, M., Dormi, A., Ambrosioni, E. Improved tolerability of the dihydropyridine calcium channel blocker lercanidipine. Doctor, 2010, no. 9, р. 33-39. Kamkin, A. G., Kiseleva, I. S., Kirischuk, S. I., Lozinskiy, I. T. Voltage-controlled calcium channels (Part II). Uspehi fiziologicheskih nauk, 2007, vol. 38, no. 1, р. 14-38. Ioele, G., Luca, M. D., Oliverio, F., Ragno, G. Prediction of photosensitivity of 1,4-dihydropyridine antihypertensives by quantitative structure-property relationship. Talanta, 2009, vol. 79, no. 5, р. 1418-1424. Abregoa, V. H., Martínez-Péreza, B., Torres, L. A., Angeles, E., Martínez, L., Marroquín-Pascual, L. J., Moya-Hernández, R., Amaro-Recillas, H. A., Rueda-Jackson, J. C., Rodríguez-Barrientos, D., Rojas-Hernández, A. Antihypertensive and antiarrhythmic properties of a para-hydroxy[bis(ortho-morpholinylmethyl)]phenyl-1,4-DHP compound: Comparison with other compounds of the same kind and relationship with logP values. European J. of Medicinal Chem., 2010, vol. 45, no. 10, р. 4622-4630. Savina, N. V., Nikitchenko, N. V., Dalivelya, O. V. Diludin and tserebrokrast bioprotectors as a model test systems in vivo. Mutagenez i kantserogenez. Ekologicheskaya genetika, 2009, vol. VII, no. 3, р. 30-43. Wojewódzka, M., Grądzka, I., Buraczewska, I., Brzóska, K., Sochanowicz, B., Goncharova, R., Kuzhir, T., Szumiel, I. Dihydropyridines decrease X-ray-induced DNA base damage in mammalian cells. Mutation Research Fundamental and Molecular Mechanisms of Mutagenesis, 2009, no. 1-2, р. 45-51. Cateni, F., Zacchigna, M., Pedemonte, N., Galietta, L. J. V., Mazzei, M. T., Fossa, P., Giampieri, M., Mazzei M. Synthesis of 4-thiophen-2′-yl-1,4-dihydropyridines as potentiators of the CFTR chloride channel. Bioorg. & Medicinal Chem., 2009, vol. 17, no. 23, р. 7894-7903. Martsevich, S. Yu. Calcium antagonists of the dihydropyridine group: evidence-based medicine data and practical recommendations for the use. Ratsionalnaya farmakoterapiya v kardiologii, 2007, vol. 3, no. 1, р. 55-59. Sturov, N. V., Kobyilyanu, G. N. The main clinical and pharmacological properties of dihydropyridine calcium channel blockers for the general practitioner. Zemskiy vrach, 2010, no. 4, р. 29-31. Shlyahto, E. V., Baranova, E. I., Bolshakova, O. O. ACE inhibitors, angiotensin receptor blockers and calcium antagonists in the treatment of hypertension. Novaya apteka, 2008, no. 4, р. 53-56. Changa, C.-C., Caoa, S., Kanga, S., Kai, L., Tian, X., Pandey, P., Fernandez Dunne, S., Luan, C.-H. D., Surmeier, J., Silverman, R. B. Antagonism of 4-substituted 1,4-dihydropyridine-3,5-dicarboxylates toward voltage-dependent L-type Ca2+ channels CaV1.3 and CaV1.2. Bioorg. & Medicinal Chem., 2010, vol. 18, no. 9, р. 3147-3158. Garaliene, V., Barsys, V., Mačys, A., Vigante, B., Krauze, A. Effect of 4-aryl-2-methyl-5-nitro-1,4-dihydropyridine-3-carboxylates on the guinea pig papillary muscle and isolated human vena saphena magna that is used for coronary artery bypass grafting. European J. of Medicinal Chem., 2011, vol. 46, no. 9, р. 4441-4447. Hui, K., Kwok, Kwok, T. C. Y., Kostelecki, W., Leen, J., Roy, P. J., Feng, Z.-P. Differential sensitivities of CaV1.2 IIS5-S6 mutants to 1,4-dihydropyridine analogs. European J. of Pharmacology, 2009, vol. 602, no. 2-3, р. 255-261. Edraki, N., Mehdipour, A. R., Khoshneviszadeh, M., Miri, R. Dihydropyridines: evaluation of their current and future pharmacological applications. Drug Discovery Today, 2009, vol. 14, no.21-22, р. 1058-1066. Kumara, A., Maurya, R. A., Sharma, S., Kumar, M., Bhatia, G. Synthesis and biological evaluation of N-aryl-1,4-dihydropyridines as novel antidyslipidemic and antioxidant agents. European J. of Medicinal Chem., 2010, vol. 45, no. 2, р. 501-509. Vlasenko, T. N., Nazarov, V. B., Grebenyuk, A. N. Modern approaches to pharmacological profilatkite of Radiation defeats Farmakologiya, 2010, vol. 11, р. 253. Ponomareva, T. V., Kalnitskiy, S. A., Vishnyakova, N. M. Medical exposure and its prevention strategy. Radiatsionnaya gigiena, 2008, vol. 1, no. 1, р. 63-68.
,4-dihydropyridine derivatives as potent antimicrobial and antioxidant agents. European J. of Medicinal Chem., 2011, vol. 46, no. 11, р. 5591-5597. Geyn, V. L., Kazantseva, M. I., Kurbatova, A. A., Voronina, E. V. Synthesis and Antibacterial Activity of 2,6-dimethyl-3,5-dialcoxycarbonyl-4-phenyl-1,4-dihydropiridines. Him. farm. zhurnal, 2011, vol. 45, no. 8, р. 28-29. Magedov, I. V., Evdokimov, N. M., Przhevalskiy, N. M. New methods of synthesizing multicomponent compounds with anticancer activity. Izvestiya Timiryazevskoy selskohozyaystvennoy akademii, 2009, no. 1, р. 115-127. Abbas, H. S., El-Sayed, W. A., Fathy, N. M. Synthesis and antitumor activity of new dihydropyridine thioglycosides and their corresponding dehydrogenated forms. European J. of Medicinal Chem., 2010, vol. 45, no. 3, р. 973-982. Afanaseva, S. M., Purtov, P. A., Taraban, M. B., Leshina, T. V. Spin chemistry of enzymatic processes. Uspehi himii, 2007, vol. 76, no. 7, р. 651-668. Severin, E. S., Rodina, A. V. Problems and prospects of modern anticancer therapy. Uspehi biologicheskoy himii, 2006, vol. 46, р. 43-64. Sirisha, K., Shekhar, M. Ch., Umasankar, K. Molecular docking studies and in vitro screening of new dihydropyridine derivatives as human MRP1 inhibitors. Bioorg. & Medicinal Chem., 2011, 19, р. 3249-3254. Abbas, H.-A. S., El Sayed, W. A., Fathy, N. M. Synthesis and antitumor activity of new dihydropyridine thioglycosides and their corresponding dehydrogenated forms. European J. of Medicinal Chem., 2010, vol. 45, р. 973-982. Hulubei, V., Meikrantz, Sc. B., Quincy, D. A. 4-Isoxazolyl-1,4-dihydropyridines exhibit binding at the multidrug-resistance transporter. Bioorg. & Medicinal Chem., 2012, vol. 20, р. 6613-6620. Coburgera, C., Wollmanna, J., M. Kruga Baumert, C., Seifert, M., Molnár, J., Lage, H., Hilgeroth, A. Novel structure-activity relationships and selectivity profiling of cage dimeric 1,4-dihydropyridines as multidrug resistance (MDR) modulators. Bioorg. & Medicinal Chem., 2010, vol. 18, no. 14, р. 4983-4990. Roh, E. J., Keller, J. M., Olah, Z., Iadarola, M. J., Jacobson, K. A. Structure-activity relationships of 1,4-dihydropyridines that act as enhancers of the vanilloid receptor 1 (TRPV1). Bioorg. & Medicinal Chem., 2008, vol. 16, no. 20, р. 9349-9358. Yamamoto, T., Niwa, S., Ohno, S., Tokumasu, M., Masuzawa, Y., Nakanishi, C., Nakajo, A., Onishi, T., Koganei, H., Fujita, S., Takeda, T., Kito, M., Ono, Y., Saitou, Y., Takahara, A., Iwata, S., Shoji, M.The structure-activity relationship study on 2-, 5-, and 6-position of the water soluble 1,4-dihydropyridine derivatives blocking N-type calcium channels. Bioorg. & Medicinal Chem. Letters, 2008, vol. 18, no.17, р. 4813 4816. Yamamoto, T., Ohno, S., Niwa, S., Tokumasu, M., Hagihara, M., Koganei, H., Fujita, Sh., Takeda, T., Saitou, Y., Iwayama, S., Takahara, A., Iwata, S., Shoji, M. Asymmetric synthesis and biological evaluations of (+)- and (−)-6-dimethoxymethyl-1,4-dihydropyridine-3-carboxylic acid derivatives blocking N-type calcium channels. Bioorg. & Medicinal Chem. Letters, 2011, vol. 21, no. 11, р. 3317-3319. Zhang, B., He, W., Shi, X., Huan, M., Huang, Q., Zhou, S. Synthesis and biological activity of the calcium modulator (R) and (S)-3-methyl 5-pentyl 2,6-dimethyl-4-(3-nitrophenyl)-1,4-dihydropyridine-3,5-dicarboxylate. Bioorg. & Medicinal Chem. Letters, 2010, vol. 20, no. 3, р. 805-808. Noole, A., Borissova, M., Lopp, M., Kanger, T. Enantioselective Organocatalytic Aza-Ene-Type Domino Reaction Leading to 1,4-Dihydropyridines. J. Org. Chem., 2011, vol. 76, р. 1538-1545. Sirijindalert, T., Hansuthirakul, K., Rashatasakhon, P., Sukwattanasinitt, M., Ajavakom, A. Novel synthetic route to 1,4-dihydropyridines from β-amino acrylates by using titanium (IV) chloride under facile conditions. Tetrahedron, 2010, vol. 66, no. 27-28, р. 5161-5167. Palakshi Reddy, B., Rajesh, K., Vijayakumar, V. Palakshi Reddy. Ionic liquid [tbmim]Cl2/AlCl3 under ultrasonic irradiation towards synthesis of 1,4-DHP’s. King Saud University, Arabian J. of Chem., 2011, р. 245-249. Sheik Mansoor, S., Aswin, K., Logaiya, K. Sudhan, S. P. N. Melamine trisulfonic acid as an efficient catalyst for the synthesis of 2,6-dimethyl-4-substituted-1,4-dihydropyridine-3,5-diethyl/dimethylcarboxylate derivatives via Hantzsch reaction in solvent free condition. King Saud University, Arabian J. of Chem., 2013, aticle in press. Kikuchi, S., Iwai, M., Murayama, H., Fukuzawa, S. Catalytic synthesis of 1,4-dihydropyridine derivatives using scandium(III) triflate. Tetrahedron Letters, 2008, vol. 49, no. 1, р. 114-116. Rafieea, E., Eavania, S., Rashidzadeha, S., Joshaghania, M. Silica supported 12-tungstophosphoric acid catalysts for synthesis of 1,4-dihydropyridines under solvent-free conditions. Inorganica Chimica Acta, 2009, vol. 362, no.10, р. 3555-3562. Sueki, Sh., Takei, R., Abe, J., Shimizu, I. Ytterbium-catalyzed synthesis of dihydropyridines. Tetrahedron Letters, 2011, vol. 52, no. 34, р. 4473-4477. Tao Chen, Xiao-Ping Xu, Hai-Feng Liu, Shun-Jun Ji. A convergent construction of 1,4-dihydropyridine scaffold containing indole fragment. Tetrahedron, 2011, vol. 67, no. 30, р. 5469-5476. Ladani, N. K., Mungra, D. C., Patel, M. P., Patel, R. G. Microwave assisted synthesis of novel Hantzsch 1,4-dihydropyridines, acridine-1,8-diones and polyhydroquinolines bearing the tetrazolo[1,5-a]quinoline moiety and their antimicrobial activity assess. Chinese Chem. Letters, 2011, vol. 22, no. 12, р. 1407-1410. Zonouz, A. M., Moghani, D. Synthesis of 1,4-Dihydropyridine derivatives under solvent-free and grinding conditions. Synthetic Communications, 2011, vol. 41, 2152-2160. Tamaddon, F., Razmi, Z., Jafari, A. A. Synthesis of 3,4-dihydropyrimidin-2(1H)-ones and 1,4-dihydropyridines using ammonium carbonate in water. Tetrahedron Letters, 2010, vol. 51, no. 8, р. 1187-1189. Rebrov, E. V. Microwave organic synthesis in microstructured reactors. Ros. Him. Zhurn., 2011, vol. LV, no. 2, р. 34-42. Sirisha, K., Bikshapathi, D., Achaiah, G., Reddy, V. M. Synthesis, antibacterial and antimycobacterial activities of some new 4-aryl/heteroaryl-2,6-dimethyl-3,5-bis-N-(aryl)-carbamoyl-1,4-dihydropyridines. European J. of Medicinal Chem., 2011, vol. 46, no. 5, р. 1564-1571. Fassihia, A., Azadpoura, Z., Delbaria, N., Saghaie, L., Memarian, H. R., Sabet, R., Alborzi, A., Miri, R., Pourabbas, B., Mardaneh, J., Mousavi, P., Moeinifard, B., Sadeghi-aliabadi, H. Synthesis and antitubercular activity of novel 4-substituted imidazolyl-2,6-dimethyl-N3,N5-bisaryl-1,4-dihydropyridine-3,5-dicarboxamides. European J. of Medicinal Chem., 2009, vol. 44, no. 8, р. 3253-3258. Kumar, R. S., Idhayadhulla, A., Abdul Nasser, A. J., Selvin, J. Synthesis and anticoagulant activity of a new series of 1,4-dihydropyridine derivatives. European J. of Medicinal Chem., 2011, vol. 46, no. 2, р. 804-810. Plotniece, A., Pajuste, K., Kaldre, D., Cekavicus, B., Vigante, B., Turovska, B., Belyakov, S., Sobolev, A., Duburs, G. Oxidation of cationic 1,4-dihydropyridine derivatives as model compounds for putative gene delivery agents. Tetrahedron, 2009, vol. 65, no. 40, р. 8344-8349. Rorlik, O., Tashma, Z., Barzilay, C. M., Srebnik, M. An investigation of the bromination of 1,4-dihydropyridine rings. Tetrahedron Letters, 2011, vol. 52, no. 7, р. 757-760. Hassana, H. A., Abdel-Aziza, M., Abuo-Rahma, G. E.-D. A.A., Farag, H. H. 1-Malonyl-1,4-dihydropyridine as a novel carrier for specific delivery of drugs to the brain. Bioorg. & Medicinal Chem., 2009, vol. 17, no. 4, р. 1681-1692. Sperger, C. A., Wanner, K. T. Regioselective addition of organomagnesium reagents to N-silyl activated nicotinic acid esters – a convenient method for the synthesis of 4,4-disubstituted 1,4-dihydronicotinates. Tetrahedron, 2009, vol. 65, no. 29-30, р. 5824-5833. 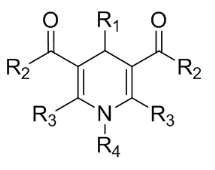 Heravi, M. M., Bakhtiari, Kh., Oskooie, Н. А., Hekmatshoar, R. Kliofen - very convenient reagent for the rapid oxidation of 1,4-dihydropyridines. Zhurnal organicheskoy himii, 2007, vol. 43, no. 9, р. 1412-1413. Peng, L., Wang, J., Lu, Z., Liu, Z.-q., Wu L.-m. N-Nitroso-2-aryl-1,3-oxazolidines catalyzed aromatization of Hantzsch 1,4-dihydropyridines. Tetrahedron Letters, 2008, vol. 49, no. 10, р. 1586-1588. Ghorbani-Choghamarani, A., Zeinivand, J. Ghorbani-Choghamarani A. Aromatization of Hantzsch 1,4-dihydropyridines with Al(NO3)3 9H2O and/or Fe(NO3)3 9H2O in the presence of silica sulfuric acid under mild and heterogeneous conditions. Synthetic Communications, 2010, vol. 40, р. 2457-2463. Nasr-Esfahani, M., Moghadam, M., Valipour, G. Efficient Oxidation of Hantzsch 1,4-Dihydropyridines with Tetrabutylammonium Peroxomonosulfate Catalyzed by Manganese(III) Schiff Base Complexes: The Effect of Schiff Base Complex on the Product Selectivity. Synthetic Communications, 2009, vol. 39, р. 3867-3879. Filipan-Litvic, M., Litvic, M., Cepanec, I., Vinkovic, V. Antimony (V) chloride-promoted room temperature aromatization of 1,4-dihydropyridines in non-acidic solvent. ARKIVOC, 2008, XI, р. 96-103. Kumar, P., Kumar, A. An Expeditious Oxidative Aromatization of Hantzsch 1,4-Dihydropyridines to Pyridines Using Cetyltrimethylammonium Peroxodisulfate: A Phase Transferring Oxidant. Bull. Korean Chem. Soc., 2010, vol. 31, no. 8, р. 2299-2303. Kumar, A., Awatar Maurya, R., Sharma, S. Oxidative aromatization of 1,4-dihydropyridines and pyrazolines using HbA–H2O2: An efficient biomimetic catalyst system providing metabolites of drug candidates. Bioorg. & Med. Chem. Letters, 2009, 19, р. 4432-4436. Su, J., Zhang, C., Lin, D., Duan, Y., Fu, X., Mu, R. Oxidative Aromatization of Hantzsch 1,4-Dihydropyridines by H2O2/V2O5 at room temperature. Synthetic Communications, 2010, vol. 40, р. 595-600. Ghorbani-Choghamarani, A., Nikoorazm, M., Goudarziafshar, H., Shiri, L., Chenani, Z. Oxidation of Hantzsch 1,4-Dihydropyridines Using Supported Nitric Acid on Silica Gel and Poly Vinyl Pyrrolidone (PVP) under Mild and Heterogeneous Conditions. Bull. Korean Chem. Soc., 2009, vol. 30, no. 4, р. 972-974. Filipan-Litvic´, М., Litvic´, M., Vinkovic´, V. An efficient, metal-free, room temperature aromatization of Hantzsch-1,4-dihydropyridines with urea–hydrogen peroxide adduct, catalyzed by molecular iodine. Tetrahedron, 2008, no. 64, р. 5649-5656. Filipan-Litvic´, M., Litvic´, M., Vinkovic, V. Rapid, efficient, room temperature aromatization of Hantzsch-1,4-dihydropyridines with vanadium(V) salts: superiority of classical technique versus microwave promoted reaction. Tetrahedron, 2008, vol. 64, р. 10912-10918. Turovska, B., Goba, I., Turovskis, I., Grinberga, S., Belyakov, S., Stupnikova, S., Liepinsh, E., Stradyin, Ya. Electrochemical oxidation of 4-mono-alkyl substituted 1,4-dihydropyridines. Himiya geterotsiklicheskih soedineniy, 2008, no. 12, р. 1829-1838. Tamaddon, F., Razmi, Z. Оxidation of 1,4-dihydropyridines and 3,4-dihydropyrimidin-2(1H)-ones to substituted pyridines and pyrimidinones using Ca(OCl)2 in aqueous media. Synthetic Communications, 2011, v. 41, р. 485-492. Filipan-Litvic´, M., Litvic´, M., Vinkovic, V. A highly efficient biomimetic aromatization of Hantzsch-1,4-dihydropyridines with t-butylhydroperoxide, catalysed by iron(III) phthalocyanine chloride. Bioorg. & Medicinal Chemi., 2008, vol. 16, р. 9276-9282. Lewanowicz, A., Gancarz, R. An intermolecular hydrogen transfer process inducing triplet biradical photochromism of 1-methyl-2,4,4,6-tetraphenyl-1,4-dihydropyridine in the solid state. J. of Photochemi. and Photobiol. A: Chem., 2008, vol. 196, no. 1, р. 59-66. Memarian, H. R., Abdoli-Senejani, M. Ultrasound-assisted photochemical oxidation of unsymmetrically substituted 1,4-dihydropyridines. Ultrasonics Sonochem., 2008, vol. 15, no. 2, р. 110-114. Liu, D., Gui, J., Wang, C., Lu, F., Yang, Y., Sun, Z. Oxidative aromatization of Hantzsch1,4-Dihydropyridines catalyzed by ferric perchlorate in ionic liquids with air. Synthetic Communications, 2010, vol. 40, р. 1004-1008. Saini, A., Kumar, S., Sandhu, J.S. New Strategy for the Oxidation of Hantzsch1,4-Dihydropyridines and Dihydropyrido[2,3-d]pyrimidines Catalyzed by DMSO under Aerobic Conditions. Synthetic Communications, 2007, vol. 37, р. 2317-2324. Liu, Zh. G., Niu, X. Q., Yu, W., Yang, L., Liu, Z. L. Pd/C-catalyzed selective reduction of aromatic azides with Hantzsch 1,4-dihydropyridine. Chinese Chem. Letters, 2008, vol. 19, no. 8, р. 885-888. Fang, X., Liu, Y.-Ch., Li, Ch. 9-Phenyl-10-methylacridinium: A Highly Efficient and Reusable Organocatalyst for Mild Aromatization of 1,4-Dihydropyridines by Molecular Oxygen. J. Org. Chem, 2007, 72, р. 8608-8610. Recupero, F., Punta, C. Free Radical Functionalization of Organic Compounds Catalyzed by N-Hydroxyphthalimide. Chem. Rev. 2007, no. 107, р. 3800-3842. Han, B., Liu, Zh., Liu, Q., Yang, L., Liu, Z.-L., Yu, W. An efficient aerobic oxidative aromatization of Hantzsch 1,4-dihydropyridines and 1,3,5-trisubstituted pyrazolines. Tetrahedron, 2006, vol. 62, р. 2492-2496.